You know that song from Holiday Inn? Bing Crosby is singing, I got plenty to be Thankful For, as he's staring at a Thanksgiving turkey? Well, it's one of my favorites. I try to watch Holiday Inn every Thanksgiving...or at least soon thereafter. Haven't made it this year, yet. Prompted by the song, and by the month of November ending, I just wanted to jot down some of the things I've been especially Thankful for this month. 1 - Thankful that Jacob was just fine by really angry when he wriggled out of my arms while on the stairs and fell, he only hit one step and bounced right back into my arms. "Tops are made out of rubber, and bottoms made out of springs..."
2 - Thankful for my Family, both by being able to have lunch with my inlaws after visiting the fam's church and hearing Karl play, and for my side as Eric and Ryan got to go pick up the TV that he gave us, it is Huge! So Blessed by such wonderful family. 3 - Thankful for the funds and availability to go for a yarn run, to get started on those holiday gifts! 5 - Thankful for Cedarwood oil, smells so nice, and works so well! 6 - Thankful for a girl's night out! It was Therapy and Book Club. I hadn't read the book, missed half the movie, but it was still wonderful to sit and laugh with my girls, and just know I'm not crazy. 7 - Thankful for cocoa butter! Why had I never bought it before? It smells so good. I had some friends and fam over to make some Oily lip balms, we used cocoa butter which was phenomenal with orange and peppermint. Oy! 8 - Thankful that Christopher got promoted from purple to brown belt! I was so proud of him on the way home we stopped at Goodwill for a new bike. He'd gotten 2 stripes the other day to finish it off. It was close, but he managed to pull it off. Good Job! 9 - Thankful for Legos! The boys and I had a great playdate at Legofest downtown, I was Thankful that there really was something for everyone in my family to enjoy. Although it did exhaust all the boys so much that by evening, only Sam hadn't plumb lost his mind, I was thankful for Sam too, he hugged me and saved my sanity from the others. 10 - Thankful to have been able to sneak away and get a start on my holiday shopping in Edinburgh with Jacob. 11 - Thankful for those that have Served, and are still Serving. Happy Veteran's Day. 12 - Thankful that Jacob was fine. He was playing on the stairs, playing with the gate, he didn't fall, but he somehow managed to turn himself upside down and get his head stuck between the gate and a step, with his feet tangled in the gate, so that I had to pick him up by his ankles. Gave me a heart attack! He was so Thankful to be right side up again, and I was just happy he was ok.
13 - Thankful for donuts with Sam. We dropped Chris off at school, and went for a donut date before school started, since Daddy had an early meeting he couldn't put Sam on the bus, we ended up with this unexpected Gift instead. 14 - Thankful for the boys' school. We are so lucky to have Brown, the teachers, the team for Chris, and we were really lucky to participate in the first annual Game Night. So Much Fun! 15 - Thankful for my Oily Raindrop class. My mother in law sent me to this Oil class, and I had a wonderful time, learned so much, and got to spend some time meeting some really neat ladies. And I stunk so good! 16 - Thankful for a day off, Sam puked in the morning, probably because he hadn't eaten, but we didn't know that right away, but I stayed home with him, and got some quiet time, a quiet day, and I was able to give Eric a Raindrop massage to help work out a smidge of the stress he's been feeling. 17 - Thankful for Christopher, especially on World Prematurity Day, since he was born at 37 weeks to the day, he was slightly premature, but he has had a lot of the problems common to preemies. He has come so far! I'm also so Thankful for the research that had been done, so that the issues he was born with were old hat to the Miracle Workers at Riley. 18 - Thankful for all the males in my household were out cold by 8:30. Now that meant it had been a really rough evening for some of the bigger boys. But I was Thankful for a quiet evening, at last. 19 - Thankful to be cozy, it was the perfect day to snuggle up with a warm flannel and a warm beverage. 20 - Thankful for being able to see Emily do her Irish Dance live and in person for the first time. 21 - Thankful for stepping out. First I got to pull Eric away from working at home so that he could have lunch, a simple chinese buffet, then I got a girl's night out at my friend Lori's for a Jamberry party and put on some silly turkey wraps, it was good to get out and laugh. 22 - Thankful for my Grandma's cookie recipes for Springerle and Pfeffernuss. I know she didn't like making them, and I get worn out doing so, but I love the finished products. I've finally learned that I have to make them before Thanksgiving so that they are perfect for dipping into coffee or tea by Christmas. 23 - Thankful for Sunday afternoon naps on a rainy day. 24 - Doubly Blessed - A. Praising the Lord that it was Kaylee's Last Day of Chemo! She got to Ring the Bell at Riley signifying the end of her treatment. And B. Blessed to see my nieces, who just arrived late last night from El Paso, and I hadn't seen in months. 25 - Thankful that Sam didn't puke. He looked a little edgy this morning, thought he was gonna, but he calmed down, and ended up going to school, so that he could participate in the Thanksgiving Feast at school. 26 - Thankful that Eric took a break from his hideous work project to finish watch Game of Thrones and just have some vegging out screen time together. 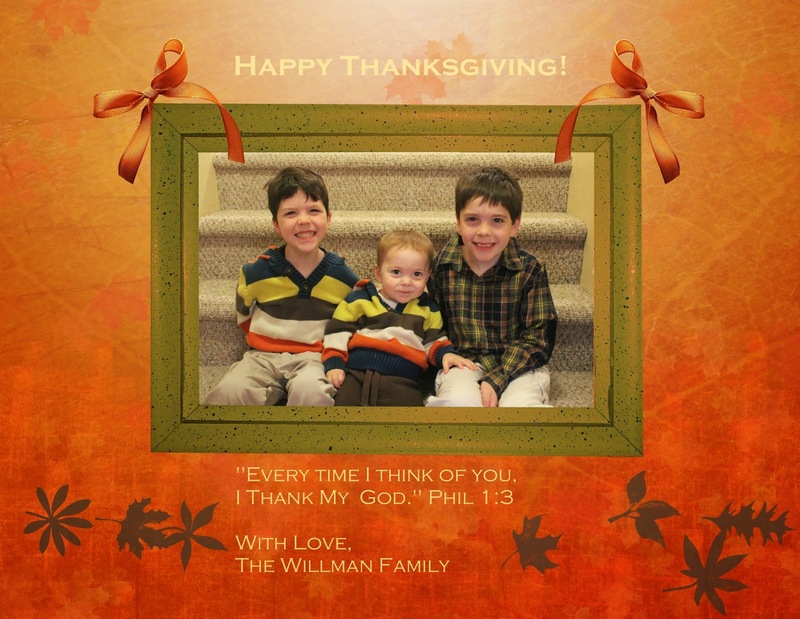 27 - Thankful for the opportunity to spend Thanksgiving at home, my boys enjoyed just chilling out, we enjoyed being able to simply have dinner with my Dad and sis, but I missed Grandpa and the extended Willman clan. 28 - Thankful for my first Gingerbreak latte of the season, and some quality time with Sam. 29 - Thankful for my inlaws, for forcing us out for a much needed break, and for buying me a much needed drink! 30 - Thankful for a warm weather day, where the boys can get outside and play off some of their endless energy. We were FREEZING just earlier this weekend, but now here we are, finding ourselves kind of on vacation, Home, with little to do, and a 50 degree day. Eric is working all weekend, and the boys and I have been on our own. So after church this morning, the boys wanted to play outside. All of them. On Thanksgiving weekend? You betcha. Though Jake isn't quite joining the big boys on bikes yet, he has found ways to get around, he gets that cozy coupe, and plays and keeps up pretty well with the big kids. And how lovely and rare to have a jacketless day in November. Wasn't it snowing just last week? Well, I gotta love Indiana weather. If you don't like it, wait a minute, it'll change. There's this group I'm in, a Facebook Photography group, and we get monthly challenges. November's Challenge was to do a picture in monochrome, that is to say, black and white. I wanted to take a picture of the sycamores, since in Indiana, when they lose their leaves, their bark is a stark white. So I wanted an unobstructed view of sycamores, maybe by a creek. I was driving around and found one off Raceway Road, near a creek/river called School Branch, which feeds into Eagle Creek. So, while the kids were in the car, I hopped out and took some pics. Then I got home and tweaked them a bit, to make them black and white. This one was my favorite, it's the one I entered in the contest. Every time we have some kind of Vacation, I ask the boys, what one thing would you like to do on your vacation? This time Christopher chose spend time with Family. Well, we checked that one off on Thanksgiving. Sam told me, he wanted to go to the Museum. So we did. Just Sam, Jake and I. We went to the Children's Museum the day after Thanksgiving, which is the day that Santa comes out and all kinds of winter fun and festivity begins. Christopher wanted to just stay home and stay in his pajamas. He had wanted to do so on Thanksgiving too, but Sam had an accident, and needed a morning bath, and when Chris saw that there were baths happening, he wanted to join. He was rather angry I made him put clothes on at all yesterday. We would have had to get dressed anyway to go to Daddy's, but I managed to stay pajamafied until after the parade. So Friday, Chris wanted to, so I let him stay home with the assignment of put his clothes away and then he could watch tv while Eric had to work. So Sam, Jacob, and I took off on our special date trip. I got Sam a hot cocoa, but he didn't drink much of it, Chris is my cocoa drinker apparently. I gave Jake a sip, and he burbled it out, and all over himself. Warm beverages must be too weird for him too. Not for me though! Sam's new favorite transformers are Bumblebee and Optimus Prime. He told me he wants dinosaur Optimus and Bumblebee for Christmas. I think that can be arranged. As soon as we got there, I asked Sam what he wanted to do. He told me Go Fishing. But he got Distracted on the way. He got to push the button on the giant snowball, and he didn't have to fight with any brothers to do it. I think he rather enjoyed it. Then he saw the Gift Shop, and wanted to go in there. Who'd have thought the Museum Gift shop would be as fun as the museum itself? Sam found this scooter seat, and he LOVED it! Then he got up, and baby brother gave it a go. Of course, Jacob could only go backwards with it, as his legs weren't short enough to get on the bar. But they loved it, and zipped around the store, to the point I was chasing them. Both little had some fun on a car table in the gift shop too. Pretty sure, this was the first time, they actually played WITH each other, as opposed to Side by Side. This was where Sam wanted to be the most. He wanted to go Ice Fishing. And though it was pretty crowded, he had some fun finding a quiet corner to do so. I decided not to see Santa with only 2 sweetboys. So actually the crowds weren't too bad. Jacob wanted to get in on the Ice Fishing action too. But he got a little dangerous waving the pole around. Then they discovered the slide! They wanted so badly to go down the slide together at the same time. And I was like, NO! And Sam kept scraping his crocs on the outside, I was worried he'd break an ankle. I think I worry too much, because they were having a Fine Time by themselves. Both boys were having a ton of fun sliding. Then Jacob figured out it was easier to go down backwards on his belly, and he had some fun with that. He's such a big kid now. One last photo by the Tree, before we hit the road home. It was a good time, and rather refreshing to just get out with Sam and Jake. It had been a long time. This was an unusual Thanksgiving for us. It was the first year since Eric and I have been together, that he/we didn't go to Marion for Thanksgiving. Eric's Grandpa passed away this past summer, and we decided long ago, that after that happened, we'd not go to Marion. Actually, I had originally said I wanted to go to New York City, to drown our sorrows, and see the parade in person, and do up the town. Unfortunately, a trip to NYC was just Not in the cards. So we stayed home. And it was Good. I love this color combo. The sweater Sam is wearing is a handmedown, 4T from Christopher. I dug it out when someone gifted Jacob with his sweater, I was so stoked, to have 2 matching boys, and I love this sweater. The problem was finding one in Chris's size, which was impossible, or finding something that matched. Jacob and I took a trip to Edinburgh earlier in the month on a mission. I recruited staff to help from Osh Kosh and Gap Kids, Gymboree, and Carter's. It was finally Carter's, where the gal was the most helpful, where we found this flannel in the same colors for Chris. They look pretty snazzy I think. Of course, with Cuteness like this, it's hard to get a bad picture. Yeah, they are certainly sweet. As I said before, I wanted to watch the Macy's Thanksgiving Parade, like sit there and watch the Whole Thing. I've never done that. We'd have it on in the background, but I never sat and just watched. I had visions of going to New York, and getting a hotel room, all Miracle on 34th Street, and watching the whole thing from above, as the balloons go by, while the kids are still young enough to care about giant character balloons. However, they didn't. They sat and watched about a half an hour, and moved on. Chris stayed an hour, and left too. I printed off a BINGO game from Jimmy Fallon about things to look for in the game, and we all ended up getting BINGO about the same time, when Santa showed up at the end. And the kids were bored by then. Eric made a squash soup while the parade was on, for our lunch. I was wary the kids might not eat just soup for lunch. So I made this. I saw something similar and fancy on Pinterest, but we didn't have a ton of fancy deli meat and cheeses. But this is all the cooking I did on Thanksgiving. I made a turkey of turkey, cheese, and crackers. Then we went down for naps. I was ready, but he elder boys weren't so much. After quick naps, and a shower for me, we packed up and drove down to my Dad's for Thanksgiving Dinner. 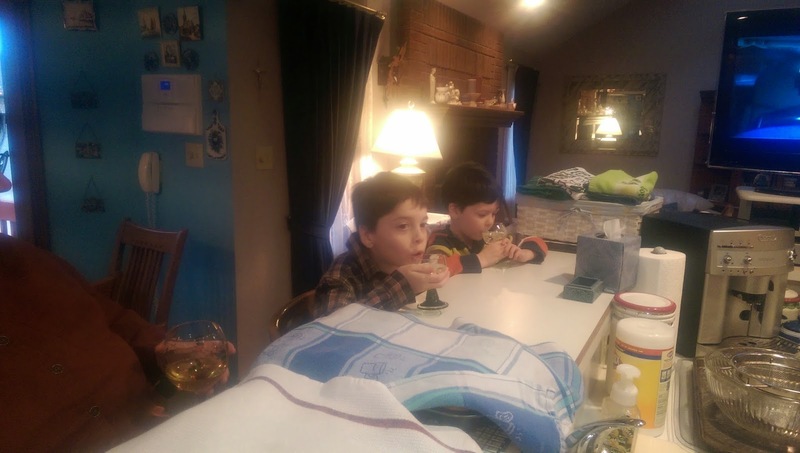 While MB was putting the finishing touches on the meal, the boys got to sample some sparkling grape juice. They LOVED it! And Oma is much nicer than I am, and Eric snapped the above picture of them drinking out of fancy german crystal glasses. Not me Johnny. But she is kinder than I.
I like Eric's picture of them drinking as they watch a splash of football better than mine. Still, you can see that they are thinking they're all Big Stuff with their 'wine'. Big Stuff indeed. What a Blessing! My sister and the girls came. They are in town for a little over a week from TX, so my Mom gifted them with tix home. So we got to have Thanksgiving dinner with the girls too. Lisa always loves to have a piece of nice fatty crunchy skin. She's the only one of us that can get away with it. I love a little bit of skin on my turkey, but she'd eat skin all day if there was enough. While putting on the finishing touches, Opa put the movie Frozen on for the kids downstairs. They were cute and still, for a minute. At least, they were for the minute I went down to check on them. Apparently, later, they trashed the basement, and Opa cleaned it up without telling us, we should've made them do it, I don't know that they'll be allowed down there adultless again anytime soon. Getting ready for the Spread. My Stepmom and Dad put on a Fabulous spread every year. This year it was us girls, our kids, and Daddy and MB's best friends Dan and Kay. It was too many for us all to fit around 1 table. So this year, for the first time, we had a Big Kids table in the living room. The kids were so excited to have their own space. And Aunt Lisa was on the chase, and we all had to yell a bit, but I was lucky, and on the back side where I couldn't get out of my seat once all people were seated. So I got far more adult conversation out of them being at a kid's table than we usually get. Thus, I had a much better time. Not too sure about Aunt Lisa, Eric, or the mess. But they ate, pretty decently, at least for them. Chris joined me in the squash lovers club, and Sam even had seconds on turkey! After dinner, the kids got to play with each other for a while. As we were fixing to leave, my sister told us she wanted a picture with Oma and Opa and all the grandkids. It's like herding cats to get them all together in one spot. But this picture turned out pretty decently. Lots of moving targets. This one was my favorite though. Ha - sometimes you need to use the Flash Cathy! When Daddy works from home, which he did a bit this week, so he could get some things done. He's been working on this hideous project, getting like only 2 or 3 hours of sleep a night, until last night, when he got 8. And he hasn't picked up the computer for the holiday, but he'll be working tomorrow. So sometimes I'll pick up drinks for us, for a pickmeup, which I did yesterday. Well, Someone found Daddy's, after he was done. And you would have thought it was Christmas. Yeah, I'm starting him early. My sisters in law brought my nephews (how I love saying Nephews! I'm still not used to saying that yet, even though they are 1 1/2 and almost 1) over for a playdate. And Mom asked me to get a picture of the boys together. They were playing so sweetly, and we were so busy yapping, and enjoying the cuteness, that we didn't think of doing a photo until just about the time they started exhibiting signs of being tired. We just barely got this pic in before Jeremiah (who calls himself Miah) lost it. And Jake was soon to follow. I think the only reason Cole was in a good mood was because he power napped on the way and snuggled up on us. But man, they are a passel of sweetness! Sam's kindergarten class had this great thing - a Thanksgiving Feast. I got to go in and help out, and the class and parent helpers made cornbread, and whipped butter, and a kind of pumpkin pie. I manned the pumpkin pie station. He gets so excited when I come to school. This was when he was working the pie station with me. It was graham crackers on the bottom, and pudding mixed with pumpkin, spices, and milk added to the top in a cup and put in the fridge. Got it all over my hands, accidently of course, and it was Not Too Shabby. I'll have to remember that the next time we want just a small pumpkin pie. I'd been working on crocheting these Christmas presents for some girls I know, and they came together so nicely, I just couldn't wait, so I gave them to them right before Thanksgiving. They are Anna and Elsa hats from Frozen that I made. I'm rather proud of them. I'm very happy with how well they turned out. My sister and nieces arrived in town for a visit late Sunday night, and I just couldn't wait to go see them, so I drove up with them Monday morning, and gave them their Christmas presents early, since the odds are very good they aren't going to be coming back from TX for Christmas. And it's cold enough for their thin blood that some nice toasty hats is the way to go. And that made me very happy. On Sunday, the boys got to sing at church. It's become this great common thing, that the children's sunday school program performs some songs about Thankfulness, maybe it's the children's choir, before Thanksgiving. I'm glad that they remembered, I hadn't. But they happened to be dressed decent, so it looked like I was prepared. They look pretty handsome in their 'handsome shirts', that's what they call their white button downs. Chris is on the far left of the group, kind of hard to see, and Sam's in the back row on the right. I was telling Eric what they sang in church, because he wasn't able to make it, and all I could remember was the chorus, "You came from heaven to earth, to show the way; from the earth to the cross, my debt, to pay..." I couldn't remember the title. Yeah, it took me singing the whole chorus to remember this one is called Lord I Lift your name on High. They look so cute doing the chorus. It's a little different from the way that we used to do it, but still adorable, and catchy, and they had fun. They did two songs, and they were so sweet. I was greatly impressed at how well the boys knew the words and motions, considering life's happenings had kept us from church for the last couple weeks. When they performed at the Grace service, I was able to see them a little bit better. I think they are a little bit easier to spot in those bright white shirts. They bring me such Joy. I love their spirits, and I love that they have no fear getting up to sing in front of the church. It's good that they learn early that when there are people that love you in the audience, there is no need to fear getting up in front of them. They are so very very loved. And I am so Thankful for all these kids, and their teachers, and our church family. My friend Mary was in town for a conference, and she had to leave this evening to go back to WI. But she stopped by just in time for dinner. Eric went all out and make brinner, a scrumptious breakfasty dinner. We made banana pancakes, with peanut butter syrup, some eggs, and maple sausages. It was So Good. Good enough for people, and perfect for my friend I've known since freshman year in college. I love her, and miss her terribly, but when we get together it's like old times. So brinner was the perfect choice, even though it wasn't entirely planned that way. We usually get together for brunch when they are in town, since breakfast time is the only time they have available. And that's always been a lot of fun. This was great to do breakfast, our tradition, at dinner time. It was so nice to get caught up. Sam took this picture of us for me, and it was pretty good. Overall, the boys didn't care too much about boring grownup conversation because Mary didn't bring her daughter to play. I find it funny that my friend's are known by their kids now. But our kids are like cousins to each other, cousins in the bond. Eric got this one of us for me. She couldn't stay too long, though we did yap for quite a bit, because she was driving home on the night shift. That's rough, I don't think I could have done a long drive alone at night, but she was/is a superchamp, and late hours work well for her, not so much for me. I think I need to go to bed. Jacob has some great funky white boy moves. I love how he leads with the hips and shoulders. He's quite enchanting. Last night, Chris's best friend Emily and her Irish Dance Troupe came to Brownsburg. Apparently, one of our local elementary schools had an International Festival. This was the first time we've gotten to see her dance since her dance school is too far for us. Sam got to get a picture with the star as she waited in the hallway for her performance. Her group did such a wonderful job. She actually came out and did a couple dances. Ems and her group getting ready to dance. They did such a great job! After they danced, they came out on the floor and 'taught' some of us how to do a circle dance. I actually didn't stink at this. And Sam was my partner, and we did pretty decently. Not as good as Em of course, but for a girl who doesn't move her body as much as she should, I didn't stink too bad. Maybe there's some Irish Dancer in me after all. These two were having a great stare off. Can you spy what Princess is staring at? Princess cracks me up. She loves to go out and chase squirrels. And they tease her. They get up a tree, and flick their tails at her. One of these days she's going to catch one. And I wonder if she'll have any idea what to do with it when she does. I hope she doesn't bring it to me. If it wasn't so cold, she'd probably have stayed out there forever. It's like Tom and Jerry in my backyard, everyday. This past weekend, I felt bad for the birdies. It was starting to get cold, and they were gonna get hungry, and our poor little feeder had been empty for like a month. So I had Eric fill it up. Apparently word got around pretty quickly! We got a woodpecker, just a little one, a little red bellied woodpecker that looked so pretty bopping back and forth among the orange swamp oak leaves in the early morning light. So pretty as fall and winter become one. We also got a visit from our friend the nuthatch. He likes to hop back and forth, act like he's getting snacks from the tree, when really, he's just getting stuff from the feeder and then going to the tree. If a bird could ask, "What'chu lookin' at? ", this fella would have. I spotted this Goldfinch all bedecked in his winter plumage already. I guess it is winter.